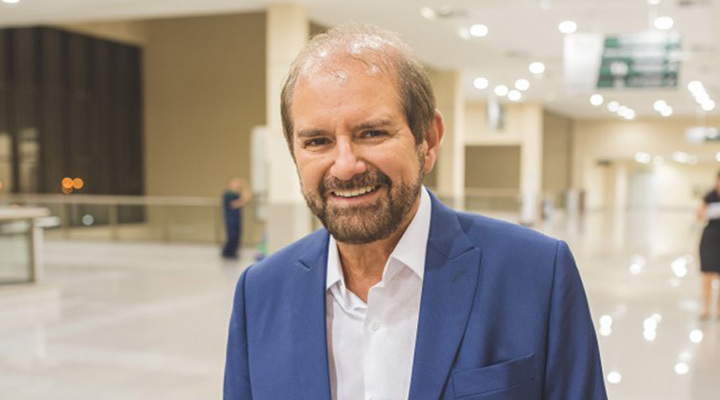 Guilherme Paulus - Founder, CVC Brasil Operadora e Agencia de Viagens S.A.
Brazilian hotelier and international entrepreneur Guilherme Paulus runs the Brazilian tour company CVC Brasil Operadora and GJP Hotels and Resorts, a brand of hotels and resorts located throughout the county. Paulus began his career working as an intern for IBM and is now considered one of the most influential businessmen in Brazil. GJP Hotels and Resorts currently operates over 20 hotels and resorts. It features hotels located in, Maceió, Recife, Salvador, São Paulo and Rio de Janeiro. The GJP brand currently employs over 5,000 people. Since he opened his first hotel in 1995, over ninety-five thousand people have passed through the doors of his properties. Where did the idea for CVC come from? The idea did not come from me, but from Carlos Vicente Cerchiari, then a state deputy. I met him on a ship trip and he told me of his willingness to open a tourist agency in Santo André, where he lived. At the time, I worked in Sao Paulo and, since I was very young and did not have the money to invest, he proposed a society in which I came in with work and he with the investment. I worked at Casa Faro, but my head was already focused on this project, so I ended up accepting the challenge. It had already been noted that I had a knack for entrepreneurship when we decided to open the store in a little street where it was the exit of a cinema. That is, a place of much movement and flow of people. We were partners for 4 years and then I went alone. I start my day thanking, I’m optimistic in the extreme. One habit I have daily is to write my weekly schedule. This makes me more organized and productive. The use of technology in our day to day life is undoubtedly one of the trends that most attract my attention. With the speed of information, we can understand and act quickly on the needs of our customers, as well as the market trends that may arise. I travel a lot to where we have hotels, but being close to the operation, without a doubt, makes me learn and get better. The exchange with employees and customers is one of the most productive habits I have as chairman of the GJP, I never left the day to day business. First advice is to ask for advice. Listen to the elders, always. Hear more. To make the dream a reality you have to love very much what you do. Sweat the shirt, be attentive to the needs of customers, changes in behavior and consumption. Many business owners end up not having this proximity to the edge of the business. I always had the vision of not focusing on just one market. Even though international tourism is very strong, I have always valued domestic tourism a lot. Besides, I travel a lot. At least 2-3 days a week I am visiting the hotels of GJP, a company of which I am founder and chairman, talking to clients, understanding their needs, as well as that of my employees. Strategies that helped grow the business were several, but one that I think is worth mentioning was when we started chartering flights in the 1980s and 1990s. Chartered flights for 1 week. We encourage the Brazilian to make the migration from road transport to the airport. There was a strong international tourism, but there was no national operator investing in domestic tourism. CVC pioneered. In the 90’s we dared and bought 100 thousand seats in VASP, to be sold in 1 year. That action was a matter in Le Monde, the French newspaper. The success was so much, that we sold in 8 months. In the early 2000s, our president at the time – Fernando Henrique Cardoso – made an agreement with France and the French government facilitating the granting of visas. We decided to open a CVC in Paris. The French is an audience that likes exotic trips, linked to nature. We offered trips to Brazil, but it was very expensive. We also expanded to a 21-day circuit that included Peru, Argentina, Foz do Iguaçu and Ushuaia. But one of the big problems is that people did not know it was a travel agency, because the sign said only CVC. In addition, we hired Brazilians to meet the French, which was another mistake. Investment is always the best way to “spend” money. I like the motto “save a penny to have a million”. The Greatest Salesman in the World, by Og Mandino. I would advise everyone who likes sales. I learned a lot from what I know, to schedule my week, etc. It’s an inspiring book. Google. It has the best research in the world.CVC was one of the first companies to have the Google terminals. We of CVC and Pan America. I have always been very attentive to bring technological innovations to the company. How was the scenario of tourism in Brazil when you started to undertake in the area? It was very embryonic. We broke the market. What is the biggest change you would highlight in the area over the last decade. We are present in almost all shopping malls in Brazil. Even with physical stores, we use online as a support all the time, whether to do research, or to close sales. We see online as a support for offline. How do you evaluate the current scenario of domestic tourism in Brazil? It goes well because Brazilians don’t not know Brazil very well. Last year CVC, which is the largest travel operator in the country, transported 6 million tourists, that is, there is still much to grow. We have a daring project to take CVC stores to smaller cities, with up to 50 thousand inhabitants. By 2020 we want to reach the number of 2000 stores. Tell us something you still dream of conquering as an entrepreneur. Turning golf into a more popular sport in Brazil and making Brazilians travel more to boutique hotels, where they can have incredible experiences, within the country.